SOLIDWORKS Simulation performance has been improved for the 2019 release as it now relies on the latest Intel Parallel Studio XE 2018, replacing previous Intel Fortran compilers used (MKL and MPI). These are used for the code preparing data for FFEPlus, Direct Sparse and Intel Direct Sparse solvers and then to compute strain and stresses. This should improve overall stability and performance with these solvers (does not affect Large Problem Direct Sparse). The Intel Direct Sparse solver has also been optimized for performance in Linear Static studies using multiple load cases (up to 25 load cases). 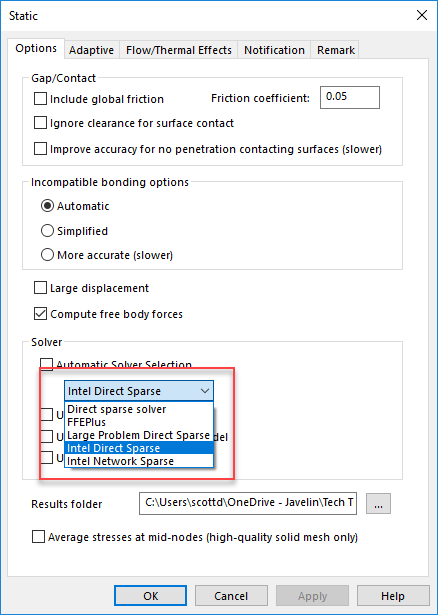 If the solver is set to Direct Sparse or Large Problem Direct Sparse, using the Load Case Manager will cause it to switch to Intel Direct Sparse solver automatically. The optimization improves performance for pressure, force and torque loads, where other loads would have similar performance. The optimization is not available when No Penetration or Virtual Wall contacts are included in any load case.